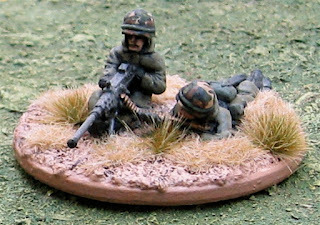 This started as a reposting of THIS POST from a few years back, when I first "finished" my 28mm Modern Military miniatures. 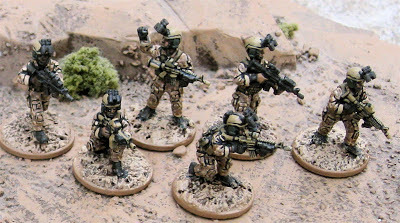 Recently I've been started playing Force on Force, rekindling my interest in modern skirmishing and i've been picking up quite a few new things which I will slowly be adding to this page as I get around to taking new pictures. 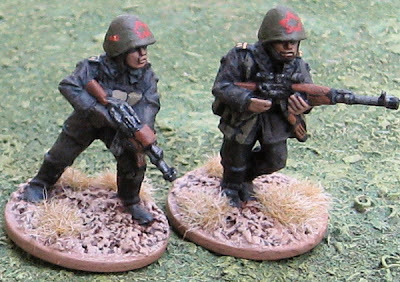 These are a mix of Cold War and post Cold War troops - basically everything post-Vietnam until NOW (my Vietnam collection is on a separate page). This Page is also in the process of being updated (mostly by copy and pasting stuff from the regular blog pages). There will likely be more changes in the near future. These are some Ultra Modern Russians. The infantry are all from The Assault Group. The BTR-80 is from S&S Models. 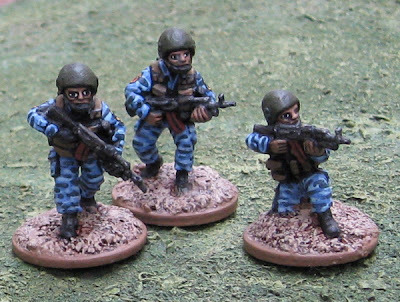 Most of my Modern Russian Troops are MVD Internal Troops (also from The Assault Group). 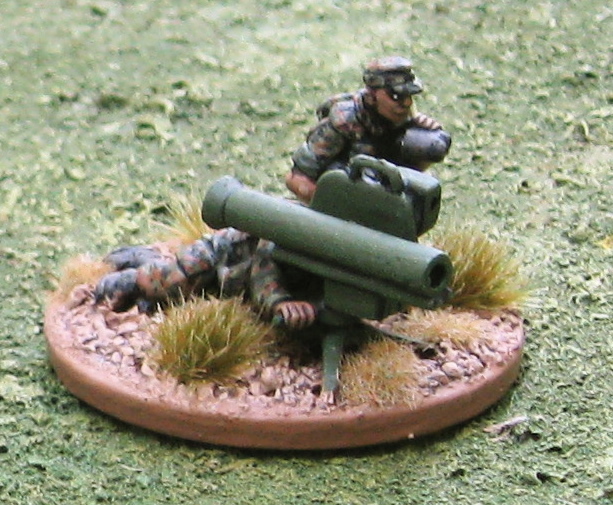 Heavier Support – I think these are PKM machine-guns and some sort of RPG. 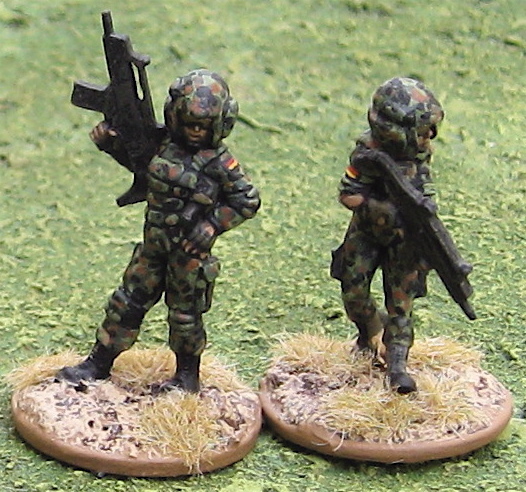 I wouldn't mind, someday, filling out the regular army force to full platoon size... Maybe add some BMP-3 or some T80s or T-90s from Imprint Models. These Cold War Soviet VDV (Air Assault Troops) from Mongrel Miniatures. It works out to about a platoon in strength. At some point I'd like to get some BMDs for these guys. For now they just have to drop into theatre by parachute and hoof it on foot! 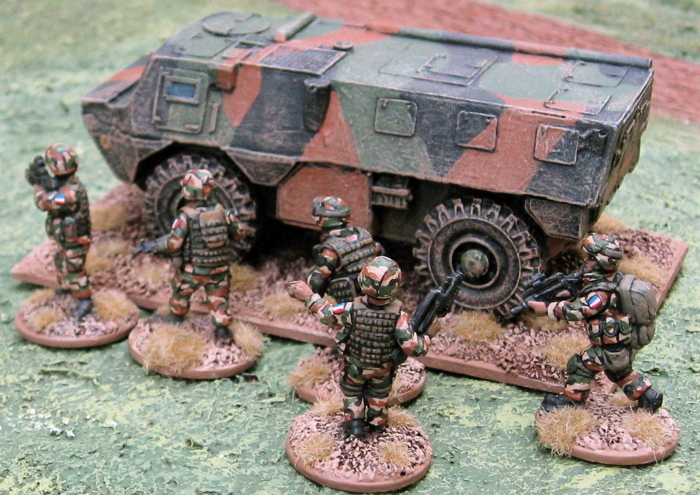 I've picked up a few Russian die-cast BTR-60 to use for a Cold War BTR Motor Rifle Platoon. 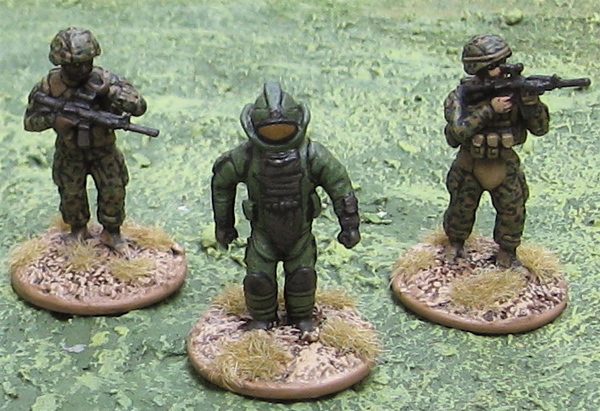 These are Cold War Soviets in NBCD Gear from Eureka Miniatures. I have roughly enough for a BTR mechanized platoon. Platoon command. Serzhant and Leytenant pointing. 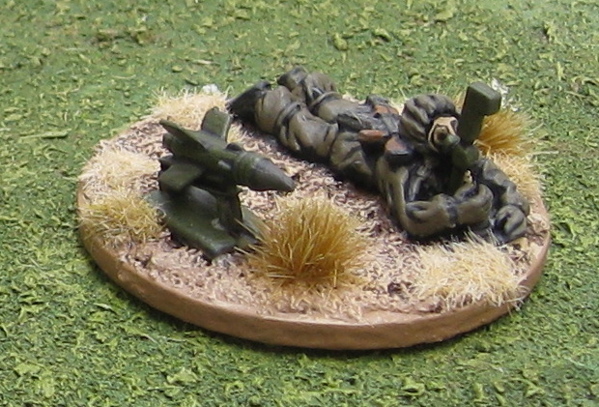 Plus a spare MG and Sniper - perhaps the Serzhant is a good scrounger and "aquired" these extra items for the platoon - they could be added to any of the other sections for some extra support. 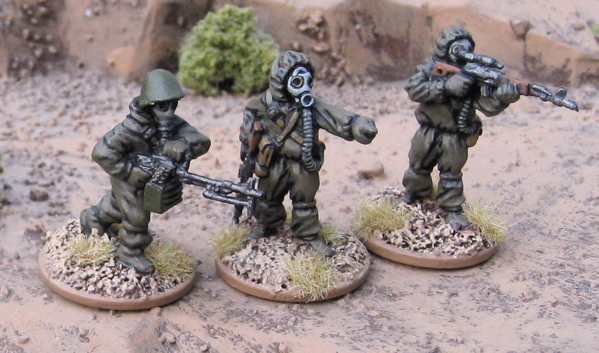 Some chemical defence or engineer types... the could be attached to the platoon if need be...? Another attachment - the Sagger (I can't really call it a "team" as it's just the one guy....) - when a slightly longer ranged (slightly harder) punch is needed to deal with armour (or bunkers?). Soviet Engineers that could be attached for clearing roads. 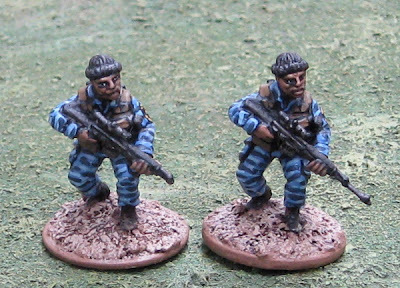 For giggles I painted up a pair of spare Mongrel Miniatures as naval infantrymen. 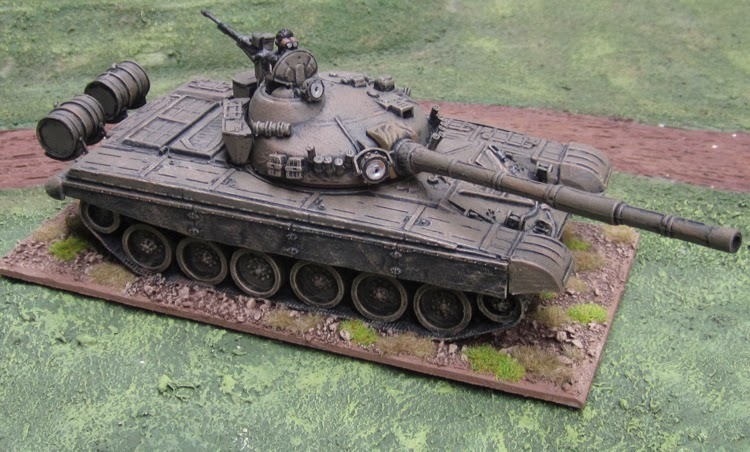 The Kitech T-72 - with a vehicle commander is from Mongrel Miniatures! I have one more plastic 1/48 scale T-72 model to assemble and paint. Unfortunately it's another Academy model, so motivation is really low. I also have a pair of plastic 1/48 scale Hind D helicopters to provide the VDV with some air support and a way to get around! As mentioned, I'd like to add some more Cold War Motor Rifle infantry (from Mongrel Miniatures). I'd probably pick up a few BMDs for them (from Sloppy Jalopy). At some point, if they ever went back into production, it might be fun to pick up a few more Mongrel Minis Motor Rifle troops and paint them up as Naval Infantry. 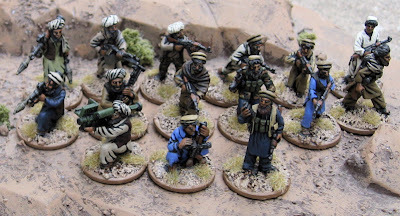 I have Afghans from Devil Dog Design, Mongrel Miniatures, The Assault Group, Empress Miniatures, and Eureka Miniatures. As they are irregulars I don't have any sort of organization for them. 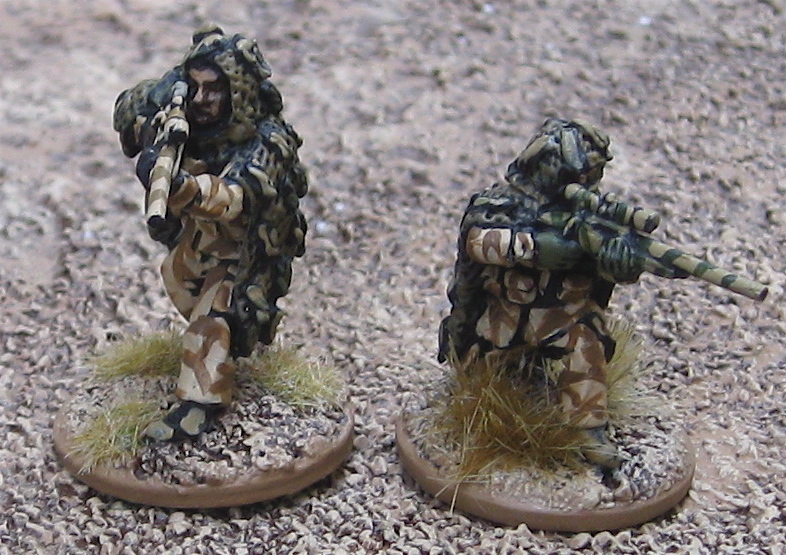 These are some more Taliban from The Assault Group. MORE Afghans - these ones are from Eureka Miniatures. A pair of Mujahideen on a Motorcycle from Empress Miniatures. A second Afghan (or Burhkaderkastani?) 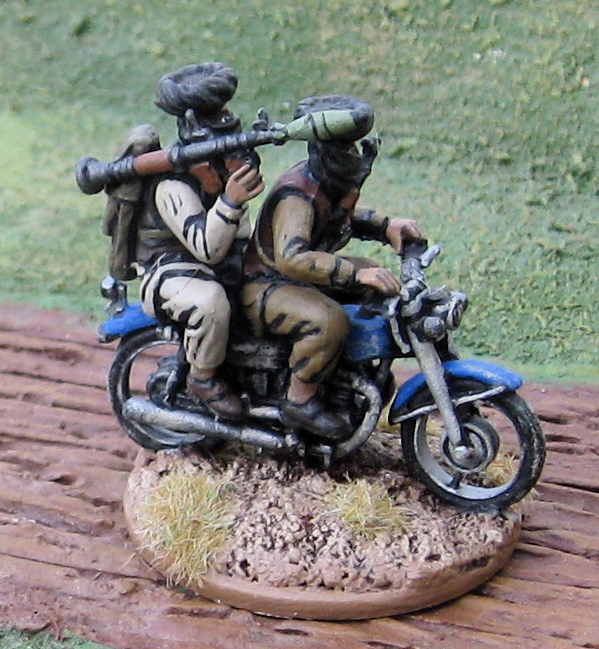 motorcycle from Empress Miniatures - this time with an RPG team! 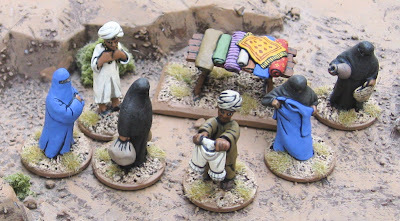 More Afghans civilians from Eureka Miniatures. The better part of a platoon of modern British paras (all from The Assault Group). I've actually picked up a few more of these and have enough that I could field a platoon of either Paras, Black Watch or Royal Regiment Fusiliers - by substituting guys with different hats. The first of three Imprint Models Warrior MCVs I picked up to mechanize the Modern Brits! 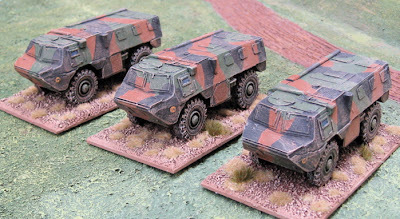 A pair of plastic 1/48 Challanger 1 tanks for some heavier support! These are Modern British SAS in Desert DPM. 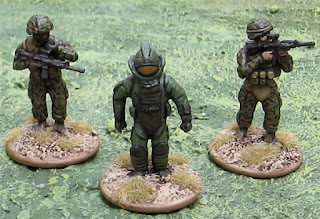 All the figures are from The Assault Group. 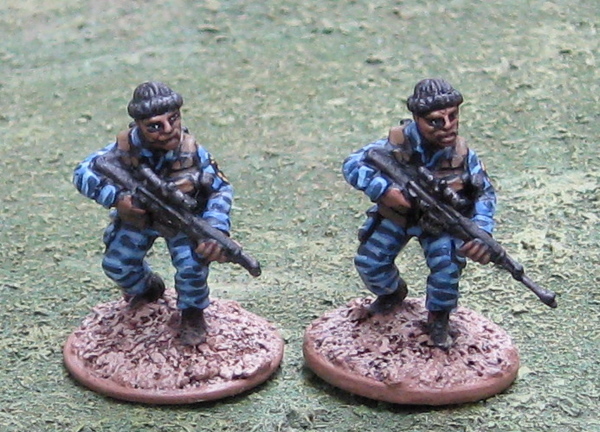 This is the first of the packs that I bought; “SAS fire team with silenced weapons”. For some reason the packs that were available (in North America, at least) when these were first available, were in packs of eight. So I have eight of them. At one point I was using these as “Patrol Leaders” – but as part of my re-thinking/reorganization I realized they probably wouldn’t use the MP5 out on “patrol” but rather they might be issued as mission specific kit for some close-quarter direct action. 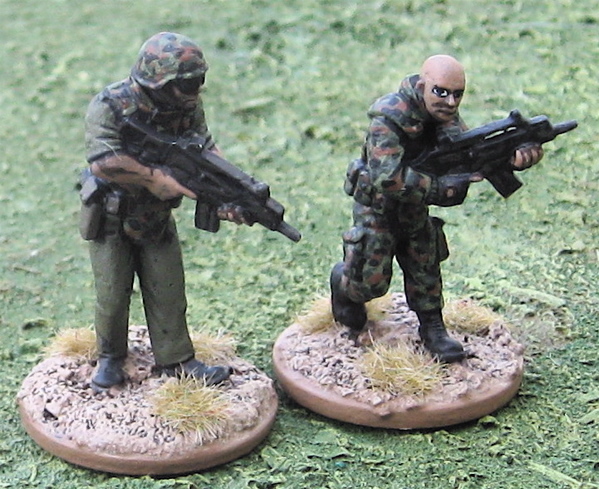 A pair of radio operators – perhaps FACs for calling in air strikes. 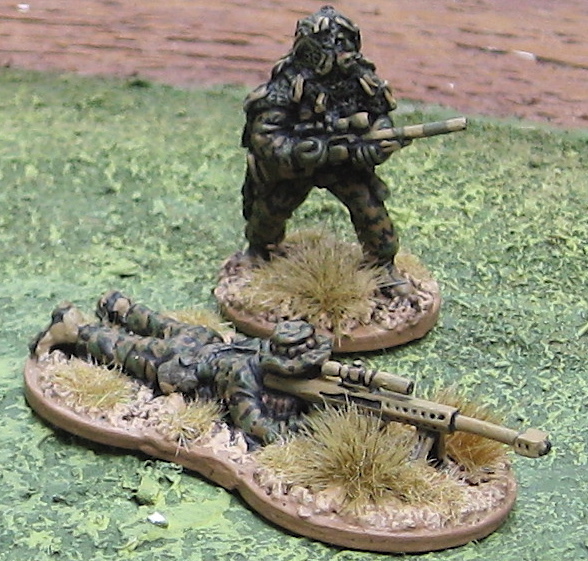 Some Snipers. I ended up with two packs of snipers – for a total of 16!? 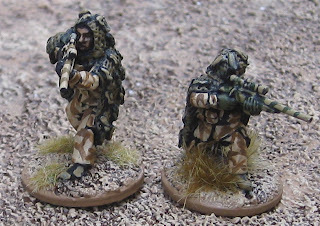 I obviously don’t need that many SAS snipers – so some of them are working their way into other forces… These two I kept for the SAS. 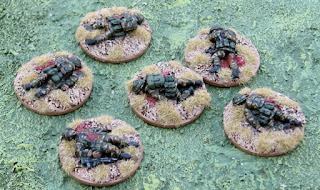 For the infantry I also have another two Warrior MCVs to finish up and a few plastic 1/48 scale Challenger models to do. I also have a small handful of Modern Marines I've started painting in Desert DPM. The bulk of the force is a platoon of regular infantry. 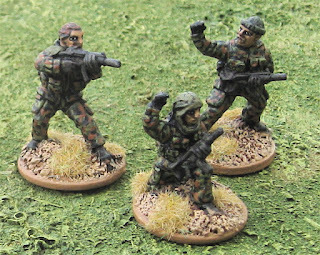 They can currently be fielded as a "leg" infantry (Light Infantry). They are a mix of Mongrel Miniatures and Gripping Beast’s MoFo miniatures. 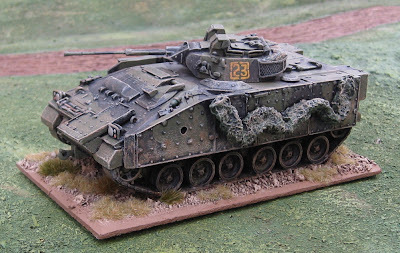 AT some point I would like to add a mechanized option in the form of four FV-432s or Saxons (or BOTH - just for a few more options!!). 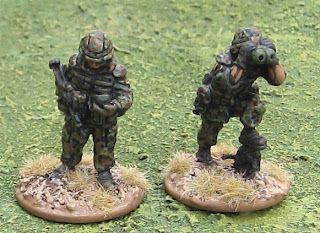 I'd also have to pick up another pair of Carl Gs as the mechanized platoons had one in each section! 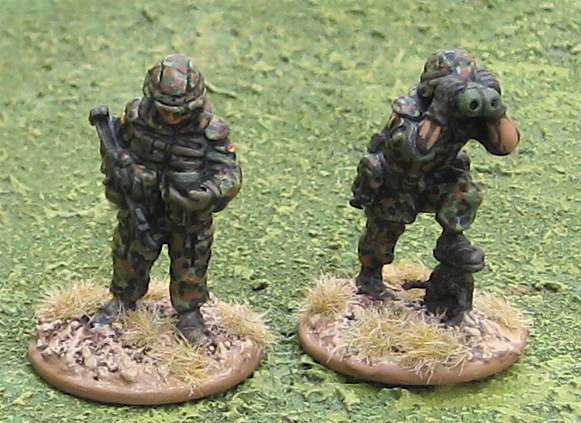 Some Battalion level support for the platoon: milan, mortar, sniper, and a forward observer team. These are all from Mongrel Miniatures. I ended up with a few spare chaps with SMGs but they can be the drivers for the FV-432s or Saxons... when I ever get them... should they ever need to dismount... 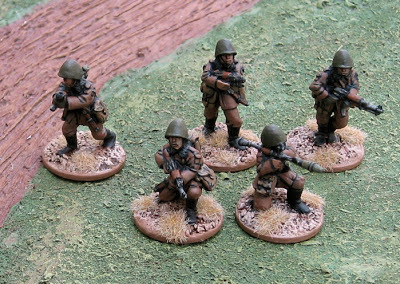 These are all from Mongrel Miniatures. 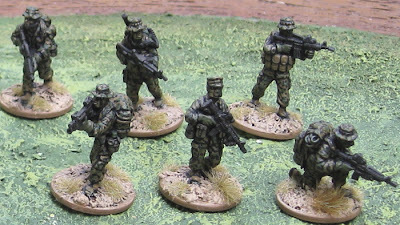 I also have some special forces types that could pass as Special Air Service, Royal Marine Mountain and Arctic Warfare Cadre, etc. for Direct Action raids behind the enemy lines... These are also a mix of Gripping Beast and Mongrel Miniatures. A handful of Americans. The four on the left are from Devil Dog Design. 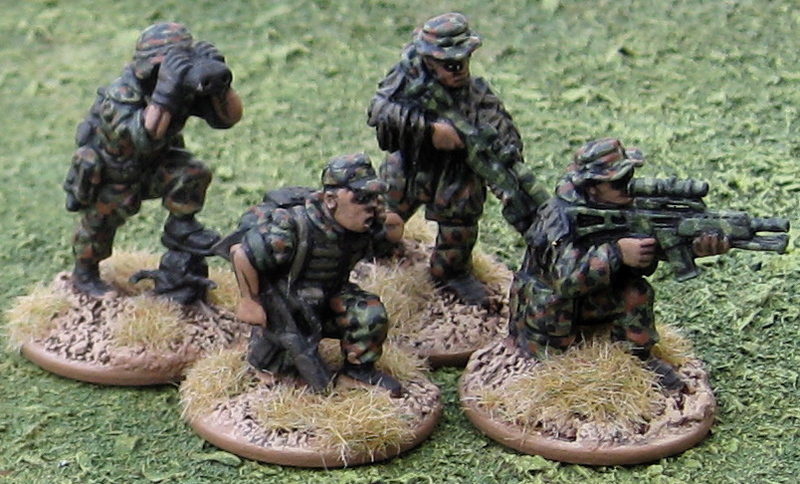 The four on the right are from Gripping Beast. The one in the middle is a converted Copplestone Castings mini. These are more "Later Cold War Americans"... Maybe when I have enough I'll bother separating them out like I have with the Russians/Soviets and British. 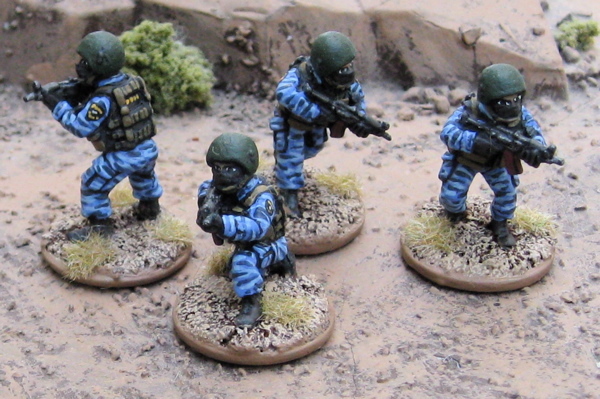 These are SEAL team members - ready to take down... whoever... from Eureka Miniatures. 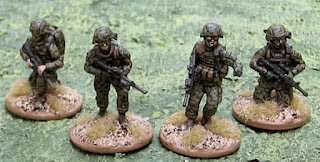 With a few exceptions noted below the bulk of this force is from Eureka Miniatures USA. I have a platoon of three squads (each with three fireteams of four plus a squad leader and a guy carrying a device for scrambling IEDs...? 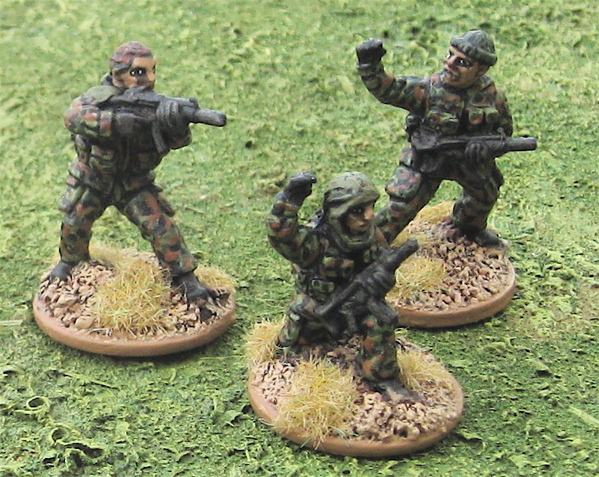 ), and a platoon command of four. 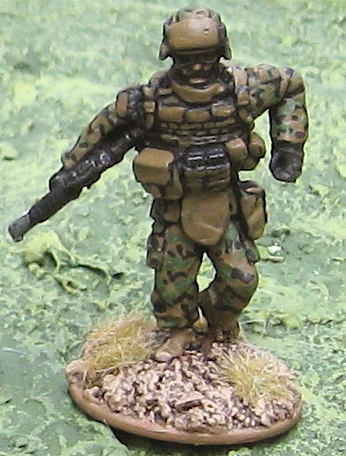 There are some EOD, Force REcon and Snipers I can also attach to the force. To support the USMC I picked up a couple of plastic "1/48 scale" M1 tank and LAV-25 models that I need to assemble and paint. I also have a bunch of Rangers from The Assault Group and Britannia Miniatures to do and a few die-cast HMMWVs to do. I'd really like to get a pair of AAVP-7A1 from Imprint Models for the marines, as well as a few of their HMMWVs. The "1/48" LAV-25s I picked up look considerably BIGGER than 1/48 so I wouldn't ming picking up some of Imprint Models LAVs and passing the plastic models off to the Sci-fi Troopers! The VAB (Véhicule de l'Avant Blindé) from S&S Models. Here are some of the chaps above with the VAB. 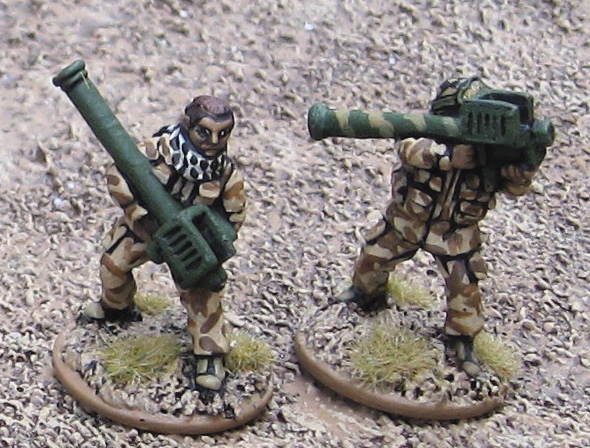 a Milan ATGW team for some heavier dismounted anti-tank support. 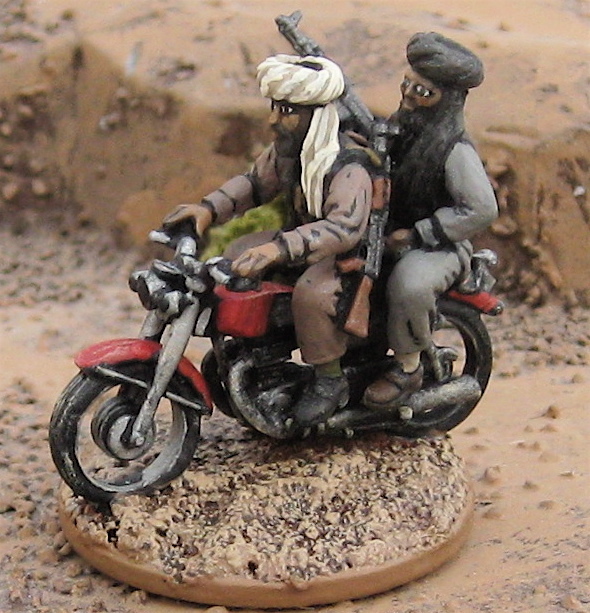 Two of the the aforementioned figures from Hasslefree Miniatures. I’m not sure what I’m going to use them as or why I got them. I’m sure it seemed like a good idea at the time…. Two more minis from Hasslefree Miniatures. I have three Marders and a pair of Leopard 2 to assemble and paint. I have two command teams, maybe one could be a forward observation officer…? One squad has berets and/or camo jackets. I kind of figured they could be a section of some “elite” formation – commandos, presidential guard, special police, etc. This force could further be supported by or ferried about by the BTR-60s above, or the T-72s I have (when I ever get them done). Other than that, this force it pretty much complete... I suppose I could get another pack or two to up the numbers of each squad - or add another squad or two for some larger actions... but for now I'm happy with just this! 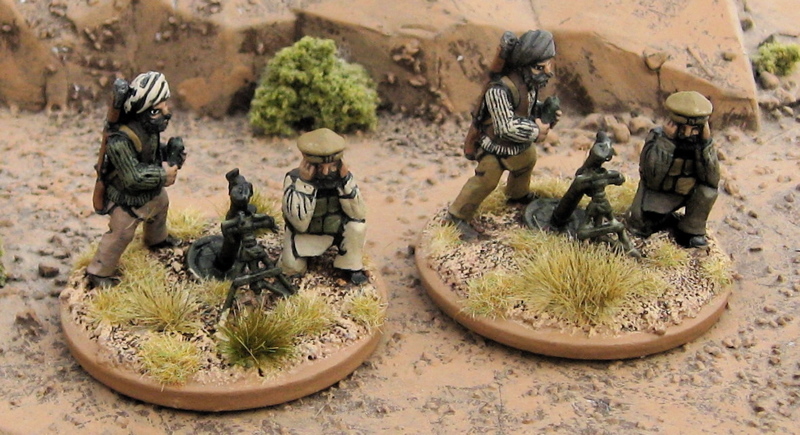 The mortar teams (from West Wind Productions). 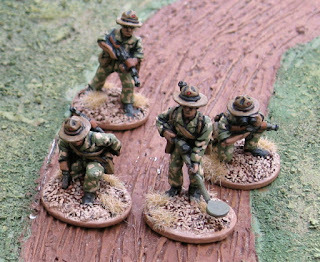 Argentines for the Falkland Islands War. Most are from Gripping Beast. 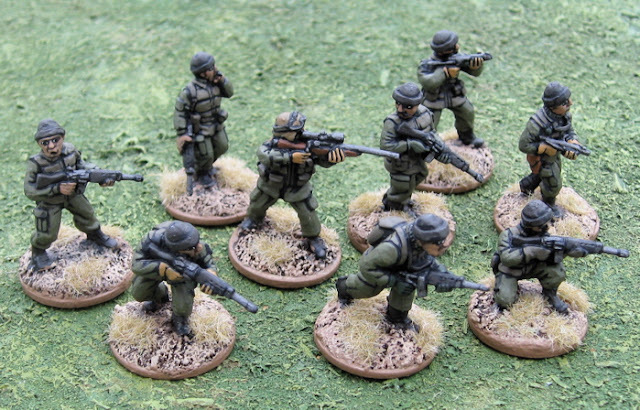 Not Military per se, but 28mm and Modern (and close enough to Military…!) The five on the left are Copplestone Castings, the remaining eight on the right are from The Assault Group. I actually have a pile more Police that I've done since this picture was taken... that'll have to be one I update soon as all the stuff I've added is DONE! At some point I thought I'd do a separate page for Modern Supers and civilians, but I'm not sure where to put the police. I have a few of the SWAT guys here, but I have a pile of regular police and plain clothes detectives.... Not to mention the Firemen and CDC Hazmat teams...! ?